Necchi BF Nova Needle Clamp In used condition, Remove rust with Evaporust. Necchi BF Nova Presser Bar door In used condition, needs a cleaning and polishing to restore it to new! Some pitting. Selling as is. Excellent for restoration. Used. Could use a minor cleaning. 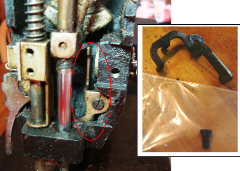 Necchi BF Nova Presser Foot In used condition, minor rust, easily removed with Evaporust. Used, needs a cleaning. This part is from the inside of the presser bar area. Please refer to pic. Necchi BF Nova Thread Slack Guide Used. Could use a minor cleaning. Selling as is. Used. Needs a cleaning and polishing to restore it to new. Comes with screws. Necchi BF Nova Stitch Length Regulator Lever. used in good condition. Needs a minor cleaning.